With an extraordinary demand for talent in the sports and entertainment space, AEG and Pepperdine University are partnering to offer a postgraduate and undergraduate level educational experience that will combine AEG’s expertise and international network of venues, sports properties and franchises, and live entertainment assets with Pepperdine University’s academic excellence. 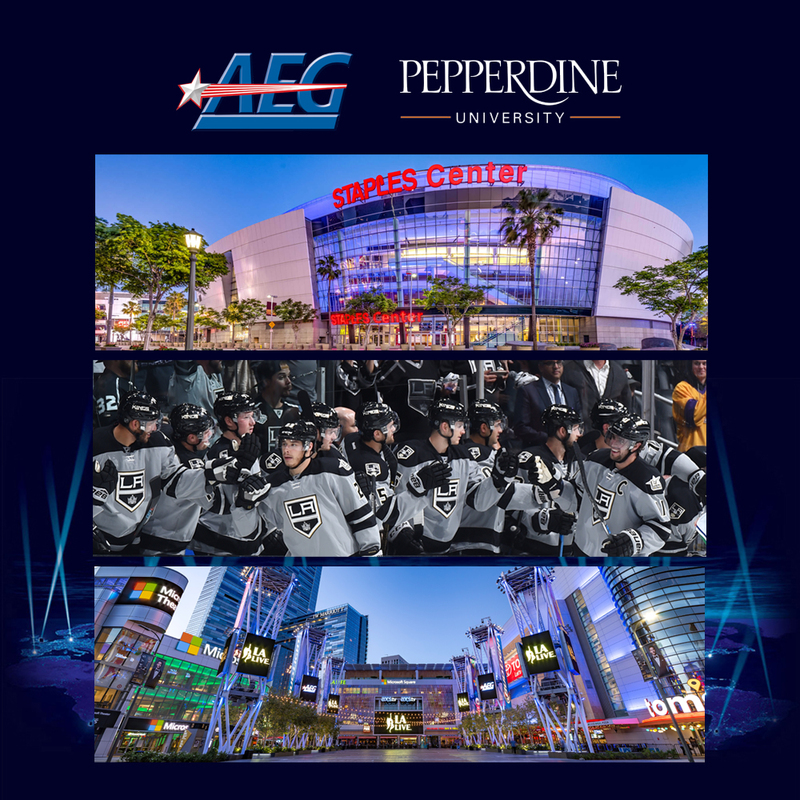 The agreement, brokered by AEG Global Partnerships, names Pepperdine University the exclusive education partner of STAPLES Center, L.A. LIVE, and the LA Kings, and will give students unprecedented access to the business acumen behind the world’s leading sports and entertainment company. The partnership will provide Pepperdine University the opportunity to build out a branded classroom within the iconic STAPLES Center, home to four professional sports franchises and numerous concerts and special events, providing the top-ranked college a strategic educational hub in downtown Los Angeles and cementing the school’s place within Los Angeles’ vibrant business community. Students enrolled in the sports and entertainment-focused program will be able to gain hands-on experience through an AEG “best-in-class” speaker series as well as first-person experiences in one of the world’s most successful arenas. The agreement also facilitates AEG providing speakers from across its world-class divisions, such as AEG Global Partnerships, AEG Live, AEG Sports, AEG Facilities, and more—further distinguishing the program by offering guidance from some of the top executives in the industry today. "Pepperdine University is a best-in-class partner that shares our collaborative values and community-focused vision,” said Jon Werbeck, vice president of AEG Global Partnerships. “Working together, we are excited to develop this one-of-a-kind platform to amplify the University’s downtown Los Angeles presence and well-respected educational reputation as we recruit and train the next generation of sports and entertainment professionals. As this relationship evolves, we look forward to expanding our partnership with the school on a global level across AEG’s network of assets." The partnership not only directly contributes to the knowledge of the students enrolled, but also the sports and entertainment industry at large. As part of the partnership, the University will have the opportunity to collaborate with AEG to produce a sports, music, entertainment, and business conference. The conference would be hosted in the heart of Los Angeles’ preeminent downtown sports and entertainment district, L.A. LIVE, and the University would work strategically with AEG and its brand partners to produce a conference that provides attendees an insightful view into the rapidly evolving sports and entertainment industries. AEG will also have the opportunity to further the education of some of its own staff through an employee integration and internship program with Pepperdine. The program will afford a number of AEG’s staff the chance to participate in the University’s prestigious MBA program while placing select Pepperdine graduate and undergraduate students in AEG’s competitive internship program. Additionally, Pepperdine will help further educational opportunities outside the classroom by developing a series of events and custom content with the LA Kings. In accordance with the University’s educational mission, it will serve as the presenting partner of “LA Kings Business of Hockey,” a regularly scheduled event that gives participants a chance to meet and gain advice from top hockey and sports business professionals both in and out of the AEG organizational network. Past events have included speakers such as Luc Robitaille, president, business operations, LA Kings, and more. AEG will also host Pepperdine University alumni at a co-created networking night at one of the 250 events at STAPLES Center each year. The event will focus on connecting the University’s prestigious alumni with top AEG executives.